Guys have body image issues too, they just aren’t talking about it. In fact, research shows over 90% of men struggle in some way with body dissatisfaction and negative affect (negative opinions of self), or negative emotions and thoughts towards one’s body (Castonguay et al. 2014). 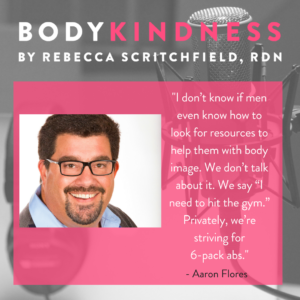 In this episode, fellow HAES dietitian Aaron Flores and I discuss the “dad bod” that requires men to have muscle and a bit of softness to show they like to workout and eat pizza. While it’s still body oppression and a singular “ideal” for men to strive to become, we acknowledge that it’s much more forgiving and flexible than the thin ideals for women. We delve into the ways men’s body image issues look different than women’s and why most men wouldn’t dare to bring up their weight and body concerns with their friends. Mainly, it has to do with societal expectations of men to maintain power, be strong, and solve problems, not have problems. We discuss how men can set boundaries with their male friends around diets, weight loss, and muscles to protect their well-being. 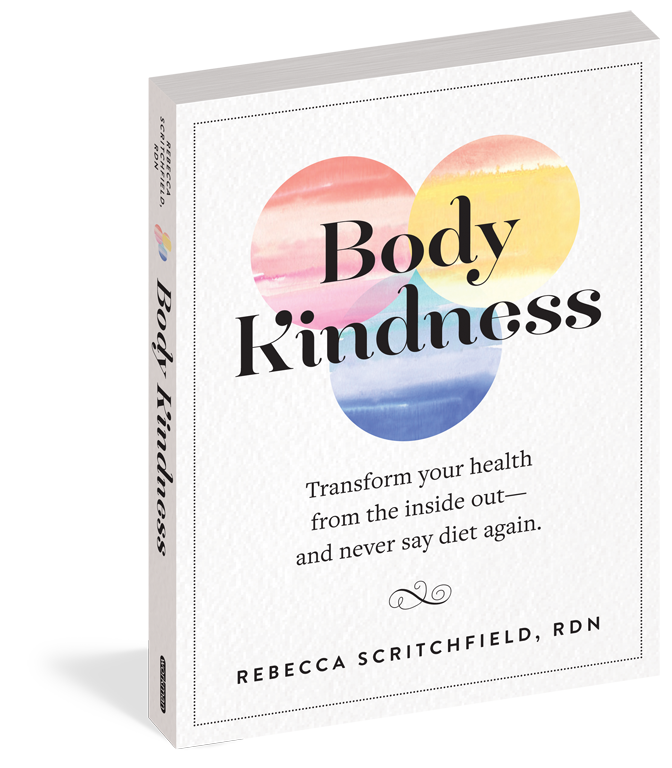 Aaron shares how he understands his male clients’ desires to change their bodies while helping them learn how to be more kind to their bodies through self-care instead of diets. Reach out to Aaron to join in on his “100 conversations” with men about their bodies. Aaron Flores is a registered dietitian nutritionist based out of Los Angeles, California. With nearly 10 years of experience, Aaron has worked with eating disorders in a variety of settings. A large part of his career was spent working at the VA Greater Los Angeles Healthcare System where he helped develop and launch one of the first Binge Eating Disorder programs to help Veterans struggling with this disorder. Since leaving the VA, Aaron has continued to work in the eating disorder community helping run groups and providing individual counseling to adolescents and adults. He currently works part-time at Center for Discovery and part-time in his private practice in Calabasas, CA. 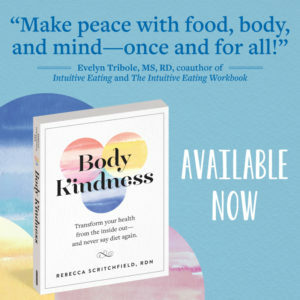 His main areas of focus are Intuitive Eating and Health at Every Size® and in his work, Aaron helps individuals learn how to make peace with food and develop body-positive behaviors. Aaron’s work has been featured during Weight Stigma Awareness Week, in blogs for the National Eating Disorder Information Centre and was the closing keynote speaker of the 2016 Binge Eating Disorder Awareness Annual Conference. Along with his work with eating disorders, he also is a co-host of the podcast, Dietitians Unplugged. 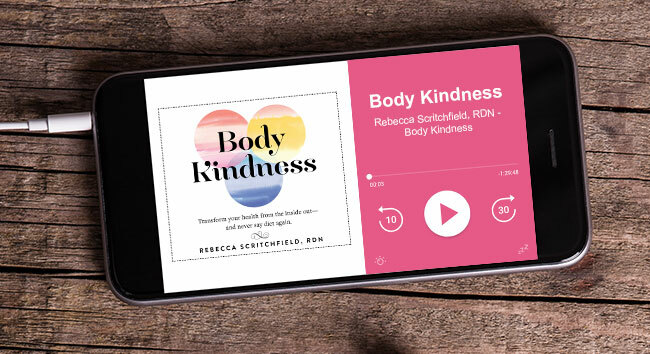 You can subscribe to Body Kindness on iTunes, Soundcloud and Stitcher. Enjoy the show? Please rate it on iTunes!